PORTLAND -- After missing the last five games with left knee soreness, Maurice Harkless reassumed his place in Portland’s starting lineup Friday night versus the Pelicans, with Jake Layman going back to the reserve unit. That didn’t stop Layman from making his presence felt. The 6-9 forward in his third season out of Maryland came off the bench to score 20 points, all in the second quarter, to help the Trail Blazers to a 128-112 victory versus the Pelicans in front of a sellout crowd of 19,598 Friday might. "I’d say when a player like that – any player – gets on a roll like that, it’s fun to watch," said Trail Blazers head coach Terry Stotts. "You could see the enthusiasm in his eyes. He was scoring in different ways, the crowd getting behind him – those things are special. You love that about the NBA. I was really happy for him." The Trail Blazers are now 28-19 overall and 20-7 at home this season. The victory extends their home winning streak to six games and is their third straight versus the Pelicans in regular season play. The win is also Terry Stotts’ 300th as Portland’s head coach. While the night, specifically the second quarter, belonged to Layman, the Trail Blazers got great production in the first quarter from both Harkless and Al-Farouq Aminu. The starting forward rotation went 6-of-11 from the field to combine for 17 of Portland’s 32 first-quarter points, which qualifies as an oddity for a team that typically looks to their starting guards for scoring. "That’s the best I’ve seen (Harkless) play in a long time," said Stotts. "The way he started the game, he made some dynamic plays." But for as good as Aminu and Harkless were in the first quarter, they couldn’t match Layman’s performance in the second. Despite his demotion back to the bench, or maybe even in spite of it, Layman put on an offensive clinic in the quarter, going 8-of-11 from the field and 4-of-7 from three in 12 minutes. "Just got hot," said Layman. "The other guys recognized it, started calling plays for me. Set some screens, they set some great some screens, got me open and I was knocking them down." 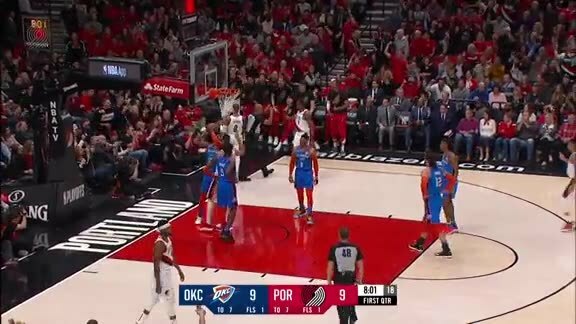 His final bucket of the quarter, a 28-foot three-pointer, sent the Moda Center into hysterics while giving the home team a 69-52 advantage. “Well (Layman) is going to let it fly, so he’s going to give himself an opportunity to have those quarters," said Stotts. "But honestly, I like the way he hit a midrange, he hit some threes, dunks obviously, and provided a lot of energy. It was just the combination of how he was scoring and actually the threes came late, he was doing the other stuff early then the threes came late." Behind Layman’s shooting clinic, Portland outscored New Orleans 42-29 in the second quarter to take a 74-58 lead into the intermission. The Trail Blazers would push their lead to as many as 21 points in the third quarter before the Pelicans managed to cut the advantage to eight after an E’Twaun Moore floater with 7:55 to play in regulation. But Portland outscored New Orleans 21-13 from there on to come away with the 16-point victory. Damian Lillard scored a team-high 24 points (8-20 FG, 2-9 3-PT, 6-8 FT) to go with five rebounds, eight assists and one steal. It was his fifth straight game with 20-plus points. CJ McCollum scored 20 points on 8-of-12 shooting (1-3 3-PT, 3-3 FT) to go with six re-bounds, three assists and two steals. Jake Layman scored 20 points on 8-of-14 shooting (4-9 3-PT) to go with one rebound. All 20 of his points came in the second quarter. Layman scored 10 straight points for the Trail Blazers from the 5:40 mark of the second quarter to the 4:02 mark of the second quarter. Jusuf Nurkic recorded 15 points (6-13 FG, 3-5 FT), 12 rebounds, five assists and two blocks in 26 minutes before fouling out. It was his 23rd double-double of the season. Al-Farouq Aminu finished with 15 points (4-12 FG, 3-6 3-PT, 4-4 FT), eight rebounds, two assists and two steals in 32 minutes. It was his third straight game scoring in double figures. In his return to action after missing five games, Maurice Harkless tallied 12 points on 4-of-6 shooting (4-4 FT) to go with two rebounds, one assist and one block. Zach Collins had eight points (4-9 FG), four rebounds and a career-high matching four assists in 19 minutes off the bench. Evan Turner notched seven points (3-9 FG, 1-2 FT), 11 rebounds and five assists in 25 minutes off the bench. His 11 rebounds matched his season high (11, Nov. 6 vs. Milwaukee). Anthony Davis led the Pelicans with 27 points (9-17 FG, 9-12 FT) to go with seven re-bounds, two assists and one block. • The Trail Blazers won their sixth straight game at Moda Center, extending their longest winning streak at home this season. • The Trail Blazers scored 74 points in the first half, marking their highest-scoring half of the season. Portland’s 42 second-quarter points tied its season high for points in a quarter. • Portland outrebounded the Pelicans, 53-41, and had 30 assists to the Pelicans 23 assists. • The Trail Blazers bench outscored the New Orleans reserves, 42-25. • Portland had 18 offensive rebounds leading to 23 second chance points while the Pelicans had seven offensive rebounds leading to nine second chance points. • The Trail Blazers victory marked the 300th win for the franchise since president of basketball operations Neil Olshey and head coach Terry Stotts arrived in Portland ahead of the 2012-13 season. "The basket looks big, just kind of throw it up there and it goes in.” -- Jake Layman on being "in the zone"
After two games at home, the Trail Blazers return to the road for their next three games starting with a tilt versus the Utah Jazz Monday night in Salt Lake City. Tipoff us scheduled for 6 p.m.